Could a new Adam be preparing us for the return of Christ�but in a way not predicted in the Bible? The answer to this question can be found in the strange turn of events at the world-famous Milagro Shrine. Based in northern New Mexico, this powerful healing site has become the American counterpart to Lourdes, France. The grounds caretaker is the gentle and unassuming Adam Gwillt. As pilgrims pray at the shrine, many have enigmatic encounters with Adam. Thousands experience astonishing healings. But suddenly and for no apparent reason, Adam disappears from sight and the healings stop. Jonathan Ramsey, the protagonist of this supernatural tale of mystery and global intrigue, is a specialist in the study of sacred places who is called in to investigate the disappearance of the shrine�s healing powers. When Ramsey first encounters the site, long forgotten emotional wounds rise to the surface. This experience culminates in a mystical apparition that draws him deeply into his assignment. Ramsey interviews the strange cast of eccentric characters involved with the shrine, slowly piecing together the story of how it grew up at the foot of a cottonwood tree and rapidly expanded after numerous paranormal events�all of which point to the caretaker�s enigmatic presence. Three rival groups descend on the shrine to find Adam. A right-wing Christian organization wants to destroy him; a progressive group of modern-day Christian Gnostics plans to convince Adam to lead them as a new savior; and a third group hopes to commercialize Adam�s healing powers. The race to find Adam moves into high gear. Eventually the parties collide in a desperate attempt to capture him. As the contest resolves itself, Ramsey suddenly realizes he�s been a pawn in a larger drama. What is revealed is the very meaning of Christ�s promise to return to earth and lead humanity into a new era�but in ways not anticipated by the churches or by anyone else. Amid the international struggle to control Adam�s powers and thereby determine the future of Christian belief, Ramsey discovers his own role in fostering an epochal renewal of Christianity. Along the way, readers also learn why sacred places create communities of faith and become portals of healing power. 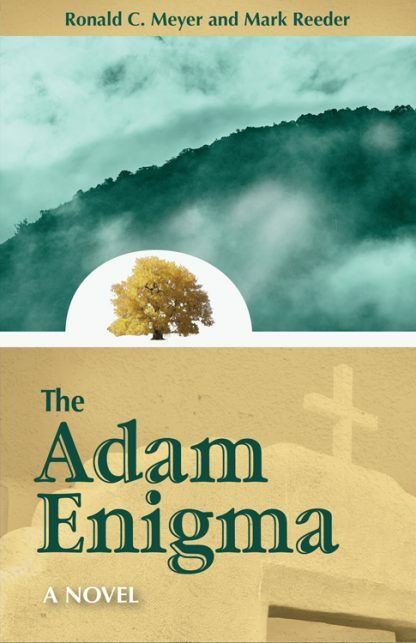 The Adam Enigma is a rare event in spiritual fiction�a postmodern novel for the liberal or progressive reader who nonetheless loves Jesus and what he stands for. It�s Jesus-oriented fiction �for the rest of us��creative, non-doctrinaire, and open to the future. Enjoy this page-turning mystery with its rich array of unforgettable characters, wild plot, and exotic settings. Ron Meyer�s recent novels include the acclaimed thrillers 18 1/2 Minutes and Extinction. In addition, he has enjoyed a distinguished career in television and movies. He wrote and produced four feature films including The Legend of Spirit Dog with Lions Gate and Searching for Haizmann with BCI/ Eclipse. His educational TV programs have appeared on PBS national television, and include the best-selling DVD The Great Indian Wars: 1540-1890. Ron has a fourth degree black belt in Aikido and is a world-renowned fossil collector. He lives in Louisville, Colorado, with his wife, Diane. Mark Reeder works as a writer and associate television producer whose programs have appeared on PBS national television. He is the prolific author of short fiction including a YA fiction series known as the 'Marc Holiday Series'.